Learn how to get around in Azendoo and to get familiar with the interface. Azendoo is a point and click app. You need to use your mouse to navigate the application. Simply click on the buttons associated with the view you are interested in. For example, if you want to take a look at your to-do list, click on my tasks. If you want to know what your team is up to, head to Activity. If you are part of more than one workspace, the sidebar will also contain icons of all the workspaces you can access as a member or guest. Your profile picture which you can click to display a menu to access your personal settings amongst other things. 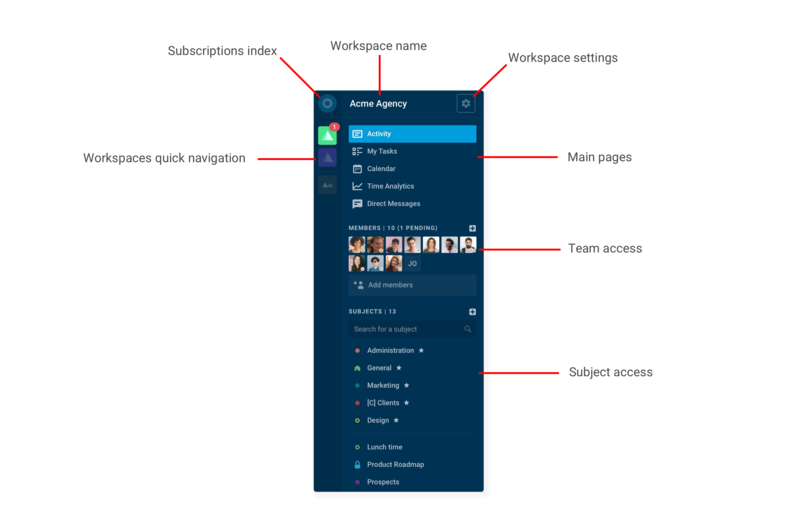 The notification center, which is where all of your current workspace notifications are available. The + button, which is a quick access to creating new tasks and conversations. The toggle sidebar button, to hide or show the sidebar.